Max had made it through first two weeks of treatment for acne fulminans. He's been on Prednisone for two weeks. The first week of treatment we noticed an immediate stop of the systemic fevers that were happening. We started to see his smile again and he was able to get out of the house for the first time in months. This is a photo of Max on the day he started treatment and the end of the first week. We saw less swelling in his face, but the spots started to diminish as well. His chest and back also started to look less irritated. The second week on Prednisone was a lot of the same on the outside, but on the inside we found he was much more amped up and having a hard time sleeping. From Monday - Wednesday he was awake for almost 40 straight hours. As the week went on he found his sleep again, but still was very jittery, and moods up and down. He also sweat a great deal more than he usually does, making us increase his fluid intake overnight. This photo is of Max's second week on Prednisone. You can see it's still less redness. Max also started tolerating baths more this week - bath times were so uncomfortable with his inflamed skin. Today Max had a Rheumatology appointment. She was very thorough and he will have some more tests to help decide next steps. In the meantime she wants him to start on Naproxen to help with the inflammation. While we were at the appointment, I realized I had forgotten to give him the morning dose of Prednisone. On the way home, I remarked at how calm he was compared to the rest of the week. By the time we got home, and got him settled we saw he was shivering. I checked his temperature and he had a fever of 102.5! We missed one dose and the fever showed back up. I gave him the Prednisone and Ibuprofen and within a couple of hours he was WILD MAN all over again. We will try weaning down to half the dose starting this upcoming week. 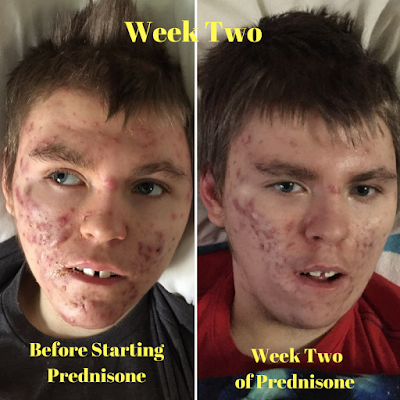 He still has two weeks left of the Prednisone treatment. After seeing how quickly the fever returned we are a bit nervous of what half the dose will do, but we can go back up to the full dose if we need and might have to do a slower wean. 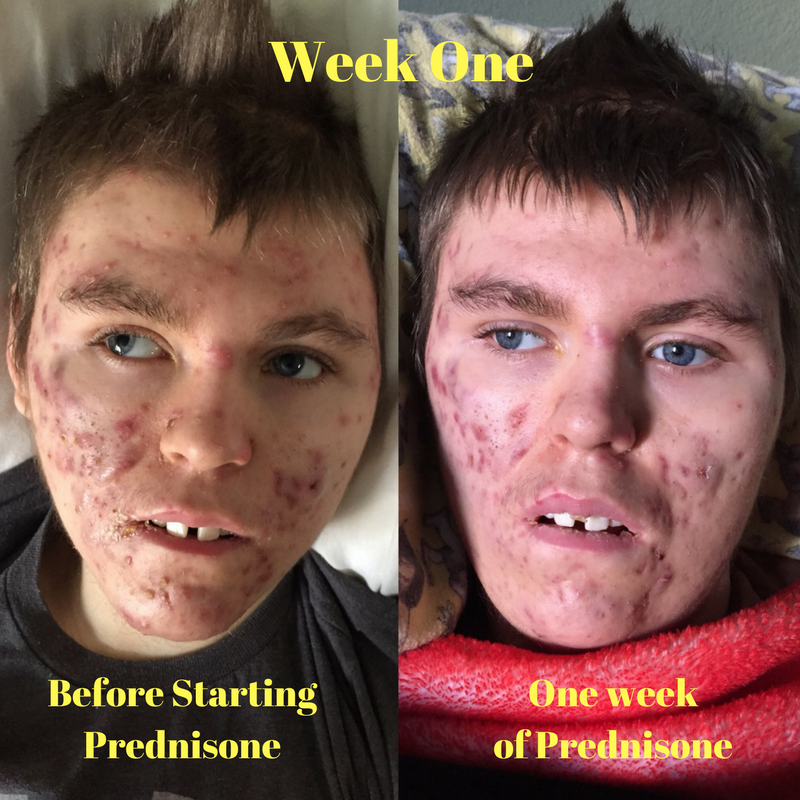 Prednisone/steroids are so difficult -- seemingly miraculous but at such a cost. I hope that Max's skin condition continues to improve, that you are able to explore the gentler CBD as an anti-inflammatory.